Greetings! It's been a while since I've posted about the Flyball Book Project. I'm actually in the process of switching jobs, so life has been extra-crazy lately (bear with me!). 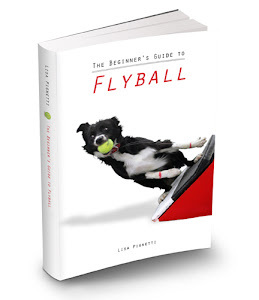 Let's dive right back into the book project with a discussion about the basic skills a dog needs for flyball. By "basic skills" I mean things that are not flyball-specific. I am a big proponent of clicker training, and had planned to start out the training section of the book with a high level introduction to clicker training before diving into things like training a box turn. I am not a professional dog trainer, however, so anything I write is just from personal experience and/or gleaned from books by Pat Miller and Jean Donaldson and training seminars with folks like Leslie McDevitt. So, first of all -- should I even try to cover clicker training at all, or should I just refer any newbies reading the book to all the other clicker training resources out there? I feel like clicker training is pretty critical, and I do reference it many times throughout the book. Before I go into any of the specific skills your dog needs to play flyball, I want to take a few minutes to talk about clicker training. I use a clicker to train almost all the foundational flyball skills – recalls, targeting, the beginnings of the box turn, picking up a ball (if the dog doesn’t like balls), standing for measuring, and drop it/out (for balls and tugs). You can buy a clicker for a dollar or two at any pet store. It looks like a little plastic kid’s toy and sounds sort of like a cricket. You use the clicker to mark (with the “click” sound it makes) exactly when your dog is doing something you like, and to let them know that a reward is coming. I think of it as a taking a picture – when I see what I want, I click. You can also mark behaviors that you like with your voice (with a command like “yes”), but the clicker is faster and more precise. Start out with a few sessions of just clicking the clicker and immediately giving your dog a treat after each click, until the dog understands that a click equals a treat (make sure you use small pieces of really delicious treats like lunchmeat, cheese, or hot dogs). This process is called “charging” the clicker. Soon you’ll find yourself with a very motivated clicker-loving dog, and from there you are able to shape almost any behavior you want. The trick is to break the behavior you want down into a lot of small steps and work on one step at a time. It may help to picture the behavior as a slow-motion frame-by-frame video. You’re going to work on shaping and rewarding each frame of the playback. For example, if you want to teach a dog that ignores tennis balls to pick up a tennis ball, you wouldn’t expect him to just walk over there and pick it up on the first try. You’d start by click/treating him for looking at the tennis ball. Then for taking a step towards the tennis ball. Then for sniffing the tennis ball. Then for putting his mouth on the tennis ball, and so on. It may be a slow process, over many short sessions, but it’s cool to watch the dog figure stuff out for himself, and this problem-solving approach is going to help build a solid training foundation. Practice training in different places, because dogs tend to learn things in context (they’ll sit beautifully in the kitchen next to the refrigerator, for example, but may look at you quizzically if you say “Sit” at the dog park). You’ll definitely see this phenomenon during flyball training – dogs who love the tennis ball or who tug like maniacs at home may show zero interest in these things at flyball practice. You can also use every meal as a training session – when I’m really trying to get one of my dogs going on something, I’ll put their kibble in a bowl, carry it out to the living room, and use a few pieces of kibble at a time for their reward while I’m working with the clicker. If you’ve never worked with a clicker before, read Karen Pryor’s book Don’t Shoot the Dog or visit her web site at www.clickertraining.com and watch some of the videos there. Pryor is one of the founders of the clicker training approach and trained dolphins with clickers back in the 1960’s before applying what she learned to dogs. Pat Miller’s book The Power of Positive Dog Training is also a great read and explains clicker training very well. Flyball is supposed to be fun. Dogs that love the game will run their hearts out every time they race. You want your dog to trust you and do his very best for you, so make all your training as positive as possible. Your dog should offer behaviors to you willingly and enthusiastically – clicker training makes this very easy. It also speeds up the training process in general so much…trust me, the clicker is like magic when used correctly. I try to ignore what my dog is doing wrong and focus on what he’s doing right during training sessions. If my dog does something wrong (especially if it’s a big Ooops, like crossing over to visit another dog early in his training), I may say, “Uh-oh! Let’s try that again” (giving him no reward for what he just did wrong) and try the exercise again. Some dogs may need a little “time-out” in their crate if they are having a really hard time paying attention to you. Don’t get mad or frustrated, just end the activity, essentially teaching your dog, “If you don’t listen, you don’t play.” You can work another dog instead for a few minutes, then try bringing him back out for another chance. A couple of my dogs are so sensitive that even an “Uh-oh!” plus no reward is enough to make them shut down, so sometimes I just reward them by degrees – for instance, I will still tug a little bit with the dog that didn’t do it quite right, but when he gets it right I will say “YES!!! !” and have a crazy tug party with him. It’s easier to keep things positive if you tweak the environment to set your dog up for success – use ring gating to keep him from running around the jumps, props to get his feet in the right place on the box, and don’t rush any steps in his training. Make sure he knows what you’re asking him to do, and that he’s doing it for you consistently, before you progress to the next step. Anybody want to debate any of what I've written above, or add to it? I don't do a lot of obedience training with my dogs, other than the very basics (sit, don't jump on the kids, don't bite my fingers off when you take treats). I focus mostly on flyball-specific skills like jumps, box turns, etc. I know, I know. One of my dogs actually didn't know how to sit until he was a year old (when my friend Barb finally taught him). You don’t really need the typical obedience commands in flyball – sit, down, stay – although they don’t hurt. For example, it is nice to be able to put your dog into a down-stay while you’re setting up jump heights or something, but usually in the ring you’re holding onto your dog for dear life while you wait to release him. A down-stay won’t cut it in that type of environment, and frankly, I’m okay with that. I love to see my dogs all cranked up and ready to explode down the lane – it reminds me of the horses in the Kentucky Derby, ready to burst out of their starting boxes. A lot of people who play other dog sports frown on what looks like a bunch of ill-mannered dogs barking uncontrollably in the lanes, but in reality many flyball dogs have lovely manners and hold all sorts of obedience titles and therapy dog certifications. These dogs just know it’s okay to let loose and have fun during flyball, just like kids know that they can run around and scream during recess but not during math class. Dogs also seem to have no trouble transitioning from one sport to the other. They may compete in obedience one weekend, agility the next weekend, and flyball the next, and perform beautifully in all three competitions. It’s all about context. Well socialized is another good suggestion for flyball dogs. You will see people of all ages and looks not to mention random children, wheelchairs, glasses, hats etc. They will often be unavoidable. First thing first. The second the clicker training lecture comes out in a book, tends to be the second I put the book down. And, I know I am not the only one. Many people who are very involved in dogs and dog sports don't care for clicker training, for a variety of reasons. Also, for a newbie, clicker training might sound like something they HAVE to do in order to do flyball. Which they don't. Most dogs I've come in close contact with in flyball are not clicker trained, but are great flyball dogs. The addition of this whole thing called clicker training, seeming like a step they have to take to do flyball, might be enough to overwhelm someone just starting out. I think it is better left to the club they decide to join as to if clicker trainng will be used in flyball class. re: Clicker Training. I don't clicker train. I use a verbal command "yes" which is similar and give jackpot rewards for correct behavior. I do think clicker can help with some dogs and people but at the same time I don't think it is the end all be all in flyball training. I think you ca get the same response with verbal commands as a clicker especially if you have used verbal commands while training other things. I would not say there is a preference over a x-pen vs a crate. There are many times that crating is limited and if the dog only stays in an x-pen then said person is taking up a lot of room because they can't use a crate. I remember a couple years that a couple tourneys actually posted that x-pens would NOT be allowed unless there were multiple dogs in the x-pen because crating was sparse. I love a clicker and have used it quite a bit in flyball training over the years. Maybe the part about clicker training could be in one of those side boxes on a page. I also use a "yes" like Kim but notice in teaching others to train their dogs they have way better timing with the clicker that with their verbal marker. I would put some info on clicker training in the book even if it's just a bit. I think what you have is great. It shows where a clicker is appropriate and the benefits of it. At the same time it covers the verbal click as well. Throughout the rest of the book I would probably refer to the click as "mark" to make folks who don't want to use it feel less offended (for lack of a better word). I like the fact that you add clicker training as an option. It has helped with one of my dogs, but as some have said it's not for everyone. Perhaps you can have a few different sections explaining basic different styles of training. You could certainly explain you prefer clicker training though too. Just perhaps give an overview of the verbal cue training too, and perhaps another method if you can find one that makes sense. I think basic obedience like recall is pretty important.For safety of the dogs if nothing else, but it does also help make practice go quicker. I like it and your explanation of how to use it is really good! I don't personally use clicker training but I use the voice marking like you mention. I have witnessed some dogs that are afraid of a clicker no matter what. Also, someone else commented not making it appear that clicker training is a must-have in flyball; I agree. New folks especially will benefit from hearing this recommendation. I always tell students it is best if they show no negative emotion at all while training with their dog. Saying a happy-sounding-ooops and let's try it again is great. Also, I like your comment about setting the dog up for 'success' rather than for failure. It works much better than allowing your dog to fail over and over again. Regarding the comment that it's nice to have a dog that is tolerant of other dogs approaching them, I think new folks need to know that it is also nice when - if it is their dog who is doing the approaching - their dog is polite about it and isn't charging up to the other dog. Some people think their dog can do no wrong even when it is running up full speed at another dog and gets right in its face which might appear to be aggressive behavior to the dog being approached. As the primary trainer for my club, I have taught 2-4 flyball classes a year for the last three years. I don't train dogs; I am not a dog trainer. I can get a dog to play flyball, and I have taught people how to play and teach their dog to play flyball. Point being, folks demonstrating an interest in flyball (committing to a flyball class) often have never done anything beyond taking their dog for a walk. Introducing a clicker to these types in this setting is not helpful. Think teach clicker, student learns clicker concepts, learns to use clicker on dog, get back to flyball training...not conducive to a class setting. On the other hand, for folks familiar with clicker training, a flyball how-to book might demonstrate behavior modification exercises beneficial to learning flyball. For example, "use targeting to teach a turn on the wall", etc. I think of clicker training as "marker training" and have seen it referred to as such more often. In marker training, a distinct, consistent marker - such as "Yes", "Good", or a "click" from a clicker, is used to mark the desired behavior and then followed up with a reward. Oddly enough, I found it easier and prefereable to use the clicker _after_ I had mastered using a verbal marker. But in my first flyball class that I took, I was handed a treat bag and a clicker. By the time I had figured out where everything went and how it was to be used, the dog had wrapped the leash around my hands and spilled the treats out onto the ground. No, I had never done more than feed 'em before I took my first flyball class. I'm thinking the problem here is there really, truly are two completely different kinds of flyball students. I totally agree with eli that in a basic flyball class environment, with random people walking in off the street, a clicker is ineffective and probably even counter-productive. The bulk of the effort with these students isn't in teaching foundation flyball skills, it's teaching them how to build a playing/working relationship with their dog in a stressful environment. I'd estimate that maybe 20% of new students even know how to motivate and reward. You can't hand them a clicker, give a quick lecture on operant conditioning, and start in on the wall turns. For this kind of class, you spend all your time on recalls/sends (with and without jumps) and retrieves (of something, preferably a ball) from a training shoot. We're not too picky about the details because at the end of a 6-8 week session, we really just want to see a happy dog that's motivated to work with their handler and minding their own business off-leash and head-to-head. If the handler makes it to this point and is willing to continue, everything else gets be filled in and refined later. On the other hand, you have the "second dog" or "second sport" effect. People find themselves a second (or third, or fourth, or however many they can fit in the van) flyball dog, and want to get a jump on training. Or you have someone crossing over from some other sport. You can assume the dog is well-mannered, crate trained, stable around others, has decent obedience, etc. They're mostly going to be working on stuff by themselves, at home, outside of a traditional class environment. Something like marker training and an emphasis on foundation skills and training theory and such is perfect for them. If you want a book that's going to work for both kinds of students... yes, well, that's a trick. I could be convinced that clicker training is a good way to handle this. Learning from a book is fundamentally different from learning in a class. The first kind of student is going to get off on instant gratification... a series of little "tricks" they can try and get their dog doing something flyball-like very quickly is going to motivate them and draw them along, and at the same time the second kind of student will be looking at all these great foundation drills and proofing exercises they can work on before breakfast. If, on the other hand, you want a book which can teach of group of the first kind of students in a group class situation (maybe guided by the second kind), you're probably going to need a very different structure. Good stuff... this third chapter is much better than the 2nd... it always amazes me that many flyball competitors/trainers (in my 15 yr experience) dont want to put the effort into foundation training - esp. the clicker -- they justify using a verbal command instead (as if they are somehow one and the same)... I think it is just lazy training. Proper shaping techniques allow for much more significant training gains --- not JMHO - this is fact!! !